If I had a dollar for every time I heard a haughtily delivered, “I left at intermission,” I could afford some sort of treatment for the strain caused by all of the eye-rolling at that lame dig. I get it—sometimes you realize early on that this is 100% not your thing. Not everything is for everyone and honestly, not everything is good. However, most things deserve a fair shake and bragging about leaving at intermission undermines the artist’s work and paints you as a destructive audience member. 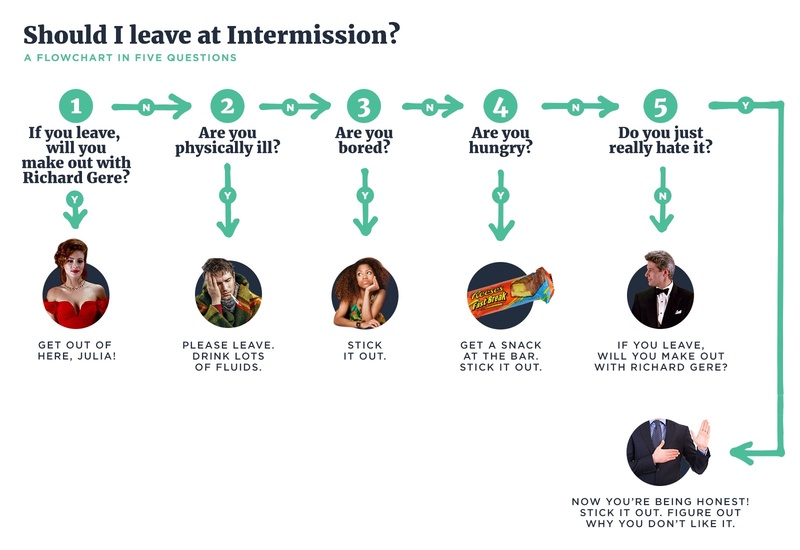 Leaving at intermission actually does more harm than good—not just for the artist, but also yourself. The first is a simple “you can’t judge a book by its cover.” If you didn’t see the whole piece, you don’t have the right to cast aspersions about the entirety of a piece. Like reading a chapter and then declaring the book trash, or taking a bite at a restaurant and spitting it out, to share a reductive criticism as gospel just makes you look bad. It’s easy to think that by leaving at intermission you’ll be able to slip away without much notice, but it really leaves a huge wake. Walk-outs are noticed (and often counted) by front of house staff, performers, and fellow audience members (especially those seated around you). It can throw artists off their game and call an audience's openness to the experience into question. By leaving, you’re often disrupting the experience for others. By coming in the first place, you are supporting artists. Sometimes your presence and attention is support enough, but sometimes you’ve ponied up some cash. Sure, you’re never going to get that time back. But promising your time to an artist is appreciated and rescinding that is rude. Spending time with art and culture provides a positive impact on health and happiness (Fujiwara, 2013). Viewing art can reduce anxiety (Binnie, 2010) or simply provide a space to relax and unwind (Packer, 2008). Challenge yourself to spend time with the art. You could end up enjoying it by the end, but if you don’t, you’re still spending time challenging yourself. So you’re going to stick through intermission. Now what? How can you make it enjoyable? You just don’t like it? Identify what you don’t like. There are lots of reasons to not enjoy something. But if you can identify what it is, you can know what to look out for next time and offer an informed rationale when sharing your dislike with others. So when someone asks, “what did you think,” you can respond with, “I thought the subject matter was distasteful,” rather than, “It was just awful.” Then your friend can decide for themselves if they share you distaste, of if that’s something that they might like themselves. Ready to level up? Once you’ve identified what’s not your cup of tea, can you find something redeeming? You’re bored? Take a lesson from sports and watch one player. Sports and performing arts aren’t that different. If you’re having trouble keeping your attention at a concert, dance recital, or theatrical performance, pick one person and follow their “track.” Are they moving things? Are they moving it so it will be within reach of another performer when they need it? What are they listening for? How are they reacting when they’re not speaking/playing/moving? Can you appreciate what this person is doing on the individual level, even if you don’t enjoy the overall experience? Can that bootstrap you into enjoying the evening? Okay, you tried and you really didn’t like it? Talk about it it—trash it, even. It’s okay to not like something, but now you’re not dragging others down with you.